Chelsea and Manchester United have played some extremely memorable games over the years, much to the delight of fans and pundits alike. Both sides have had poor outings in the Premier League by their standards. United finished a distant second behind winners Manchester City while Chelsea ended the season at the 5th position and will have to bear the ignominy of having missed out on Champions’ League qualification for the 2nd time in 3 years. Some of their encounters have occurred in the FA Cup. The FA Cup provides a chance for both the sides to end their season on a high. As these two heavyweights prepare to meet for the 181st time in the final of the FA Cup 2018, we look back at some of the finest games played between the clubs over the years. Having just played a classic and controversial game in the league three days ago, the two teams stepped on the field again in the League cup. With emotions still high from the game on the weekend, both teams were highly motivated to get to the quarter-final. The game turned out to be one of greatest cup ties of all time as Manchester United thrice led in regulation time through Ryan Giggs, Javier Hernandez, and Nani. However, the lead was cut back by Chelsea through two penalties by David Luiz and Eden Hazard with a Gary Cahill goal sandwiched between them. The third equalizer by Hazard had come in what was almost the last kick of normal time. Extra time loomed in but Chelsea at home then turned out to be too much for a young Manchester United side to handle. Goals by Daniel Sturridge and Ramires were enough to take Chelsea into the next round and a late by a penalty by Ryan Giggs turned out to be nothing but a consolation goal. This game was also Sir Alex’s last in the League Cup. Three years after Jose’s Mourinho arrival at Chelsea had ensured a healthy rivalry between the sides for the Premier League throne, the two teams met for the first ever FACup final at the new Wembley Stadium. Having become the heavyweights that they were and with history beckoning, there was indeed a lot of hanging around on this match. The game turned out to be a classic with neither team giving an inch to the other. Regulation time finished with the deadlock unbroken. Things did not seem to change in extra time too as penalty shootout loomed closer. With only 4 minutes left Didier Drogba, not for the first time nor for the last time, scored in a final to ensure Chelsea lift the title. With this goal, the Blues completed the Cup Double having won the League Cup earlier in the season while United had to contend with just a Premier League title. This was also a unique moment in Chelsea’s history as 7 years ago, they had also won the last FA cup final at the old Wembley. In Moscow, Manchester United and Chelsea met for what could be called as one of the crowning moments of English football. The two English heavyweights met in the biggest game of the season, the U.E.F.A Champions League final. The rivalry was taken to another level as European football witnessed one of its greatest nights. United got an early lead through a Cristiano Ronaldo goal. Chelsea got back in the game at the brink of half-time with Frank Lampard thumped one in for the Blues. After that, Chelsea hit the woodwork twice and United was denied by some brilliant saves from Petr Cech. The game had also gone into extra time like the aforementioned FA Cup final, but here instead of scoring the goal, Didier Drogba was sent off for slapping Nemanja Vidic in an altercation between the sides. The game then went into the penalty shootouts where it seemed all heading in Chelsea’s direction as Cristiano Ronaldo uncharacteristically missed his spot kick. This left Blues’ captain John Terry to make it the perfect finish as he stepped on to take what would have been the missing penalty. But it wasn’t to be for him as he slipped while taking the kick and ended up shooting at the crossbar. Then, Nicolas Anelka again missed for the Londoners as Edwin Van Der Saar’s save made Manchester United the European champions. The club had won both the Premier League and European Cup that year and ensured it to be one of the greatest moments in their rich history. Chelsea was not as big a name in the early 2000s, as they are now. But they were United’s bogey team. 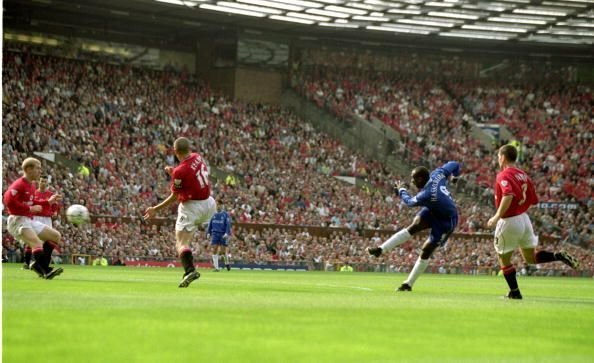 Riding on a beautiful Jimmy Floyd Hasselbank volley, Chelsea took the lead but Paul Scholes equalized for the home side in an equally gorgeous manner. Teddy Sheringham and David Beckham extended the lead further for the Red Devils. However, fate had other plans. Andre Flo struck in the 45th and 70th minute for the Blues, who were lucky to not concede a late Andy Cole goal thanks to an incredible goal-line clearance from Le Saux. The Red Devils were left frustrated but it was one of the finest United-Chelsea games in the pre-Abramovich era. It has been years since United last won a game at Stamford Bridge but the visitors were favorites this time. Buoyed by the absence of Ashley Cole and John Terry’s injury, they started the game with gusto but fate had other plans. A Jonny Evans own goal followed by a thunderous Juan Mata volley and a David Luiz header gave the Londoners a 3-0 lead. However, the Red Devils hit back with Wayne Rooney scoring twice from the penalty spot in a space of 11 minutes. Both penalties were under extremely controversial circumstances. This buoyed the away side who kept pressing for the equalizer, which they finally found in the 84th minute as Chicharito headed home a Ryan Giggs cross to salvage a point. It was a game that perfectly demonstrated the explosive nature of this contest and will go down as one of the greatest Premier League games ever.